Delicious things definitely come in small packages! It’s clear as soon as you walk into to Sushi Garden that you are going to be looked after. The service is certainly attentive and this attention to detail translates elegantly to the overall atmosphere in the restaurant. The décor is tasteful, simplistic, yet authentic. The kitchen is visible from our table, with the sushi chefs at work and at one with the diners in true Japanese spirit. 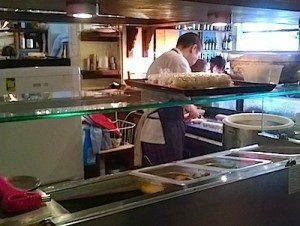 I instantly have a good feeling about this, the anticipation of what is being created behind the small wooden bar that separates us from our food, quickly gets my taste buds going. The thing I find hardest about eating out is picking what to eat. I love to try something different, but I also want to know I won’t gaze around the restaurant at the other diners and get food envy when I see that they’ve spotted something on the menu that has gone under my radar. In this regard, what always pleases more than anything else is the option to try a little bit of everything that takes my fancy. A mixture of those things I know I’ll like, but with some surprises thrown in for good measure. This is where Sushi Garden is great in equal measure for those of us who are less adventurous and also those of us who want to throw ourselves into the cuisine and try something new. In order to get a taste of some of the best they have to offer, my partner and I decide to go for one of their nicely rounded ‘special courses’, which are designed on the menu as a kind of taster or tapas style meal for one. 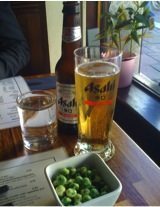 We waste no time in asking the waitress, who is quick to approach us for our drinks order and to present a small bowl of wasabi peas, whether the ‘Umi’ special course could be enough for two, as it seems to us to be a lot of food. She is very helpful, and honest, suggesting that we could share this as a main and supplement it with a few extra dishes. We don’t need any extra encouragement; we already have our eye on some other interesting, mouthwatering options. We order two Asahi beers, from the extensive drinks menu spanning several kinds of Sake, ‘Umeshu’ plum wine, sweet potato ‘Shochu’, Japanese cocktails, a wide selection of wines, champagne and spirits. There are also several non-alcoholic options; juices, smoothies and some wonderful sounding teas. Then we ask for a few more minutes to finalise our decision on food. Not long after the order is placed the first two dishes arrive. The Takowosa (octopus with wasabi), which comes as part of the Umi course, along with a small but perfectly sized portion of vegetable tempura, certainly ticks the ‘try something new’ box. This small dish, comprised of little pieces of octopus in an almost gelatinous, sweet yet acidic sauce, is surprisingly flavourful. An instant favourite however, is the ‘Ika Mayo’, ordered from the Fried Dishes as an addition to our Umi course, not Mayo in the conventional sense, but by no means disappointing. Deep-fried, tender squid, with a sweet drizzling of dark Japanese sauce, this dish is an absolute delight. After this, the dishes come in thick and fast, each a different size, but all beautifully simple and distinctly different in taste. 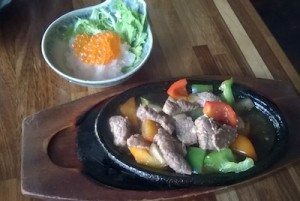 The Sizzling Beef, packed with umami flavor and accompanied by colourful peppers, is consumed almost as soon as it lands. 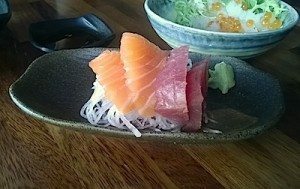 The salmon and tuna sashimi – literally one of my favourite things – arrives vivid and wonderful and tastes as good as it looks, I could hardly bear to share it. 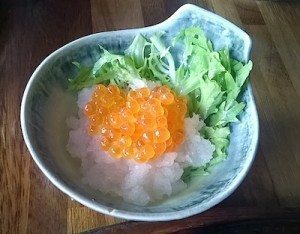 The ‘Ikura Oroshi’ (salmon roe with ground radish) is salty, fresh and light all at the same time, with all the different elements of this fundamentally simple dish again complimenting one another. With the sushi chefs hard at work in the kitchen, we expect a little wait before being presented with the finale, as by this time the restaurant is significantly busier. in the meantime, which we will ourselves not to fill up on! When it arrives, we know it has been worth the (very reasonable) wait. Little pieces of fish and avocado art, decorating delicate plates, we tuck into our salmon and tuna Nigiri, ‘Cheesy Dragon’ and ‘Cheesy Salmon’, probably slightly too eagerly, but with complete appreciation. We comment to each other how we can’t wait to come back and try all the other sushi on the menu, when we realise we still have our Ramen soup to come! Both thankful we ordered our ‘Umi’ special course to share and with one extremely satisfying Ramen soup polished off, cue the only appropriate desert to follow, powder pink mochi. Glutinous rice cakes filled with red bean paste, you can’t get much more traditional than this. Having had these before, we are thrilled to be given these for dessert, as the ‘Dessert’ in the Umi course is left as somewhat of a mystery until this point. At Sushi Garden, I think it’s safe to say that you can’t really go wrong. It is clear a lot of love and pride goes into the preparation of all of their dishes. 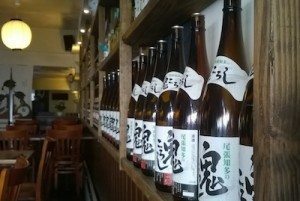 Covering all the best elements of Japanese dining, with an extensive range of Sushi, as you’d expect from a restaurant with this name, but also some of the staple rice and noodle dishes you know and love. You could eat here on a budget, but it is also easy to be more extravagant. Will I be going back…absolutely no question I will! I consider it mark of a great restaurant, not to mention an interesting, intriguing and enticing menu, if you’re left really full and very happy at the end of your meal but you can’t help thinking ‘what about everything else, I bet it’s great, I can’t wait to ty it next time!’ We were certainly thinking this when we left Sushi Garden!